Looking forward to swimming this summer? Get your swimming pool certified TODAY for just $149! GET A FREE CPR SIGNAGE BOARD WITH EVERY CERTIFICATE! Your Property will need a swimming pool inspection and a valid certificate of compliance before you can sell or lease a property with a pool. In addition, for peace of mind, one of our qualified inspectors carry out an inspection and issue you with a compliance certificate to ensure your pool is compliant and safe. 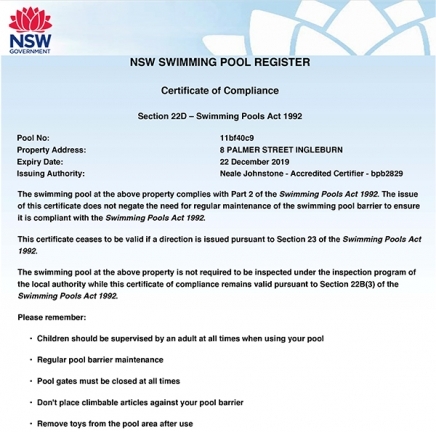 HouseCheck NSW are compliant with the "Swimming Pools Act 1992"
its regulations work together with Australian Standards to establish the safety standards for backyard swimming pools. Looking for Swimming Pool Certification? GET A FREE CPR SIGNAGE BOARD + COMPLIANCE CERTIFICATE WITH EVERY PURCHASE - VALUED AT $99! NOTE: You are required by law to have a CPR board visible. "The team at HouseCheck NSW did a great job certifing our swimming pool. Looking forward to taking the first dip!"